Today ESO announces the release of a stunning new image of one of our nearest galactic neighbours, Barnard's Galaxy, also known as NGC 6822. The galaxy contains regions of rich star formation and curious nebulae, such as the bubble clearly visible in the upper left of this remarkable vista. 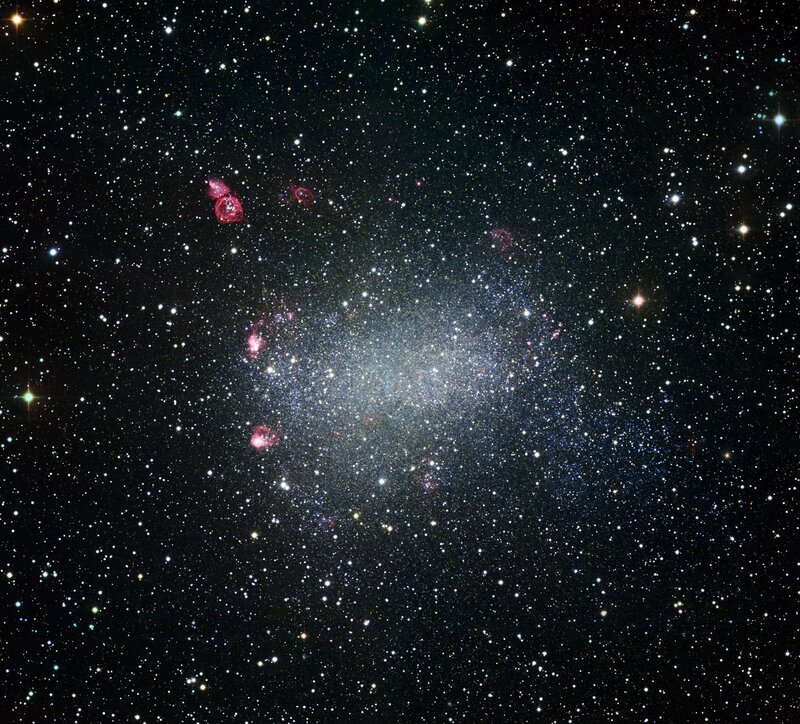 Astronomers classify NGC 6822 as an irregular dwarf galaxy because of its odd shape and relatively diminutive size by galactic standards. The strange shapes of these cosmic misfits help researchers understand how galaxies interact, evolve and occasionally "cannibalise" each other, leaving behind radiant, star-filled scraps. 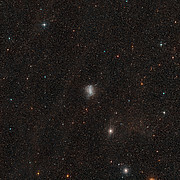 In the new ESO image, Barnard’s Galaxy glows beneath a sea of foreground stars in the direction of the constellation of Sagittarius (the Archer). At the relatively close distance of about 1.6 million light-years, Barnard’s Galaxy is a member of the Local Group, the archipelago of galaxies that includes our home, the Milky Way. The nickname of NGC 6822 comes from its discoverer, the American astronomer Edward Emerson Barnard, who first spied this visually elusive cosmic islet using a 125-millimetre aperture refractor in 1884. Astronomers obtained this latest portrait using the Wide Field Imager (WFI) attached to the 2.2-metre MPG/ESO telescope at ESO’s La Silla Observatory in northern Chile. 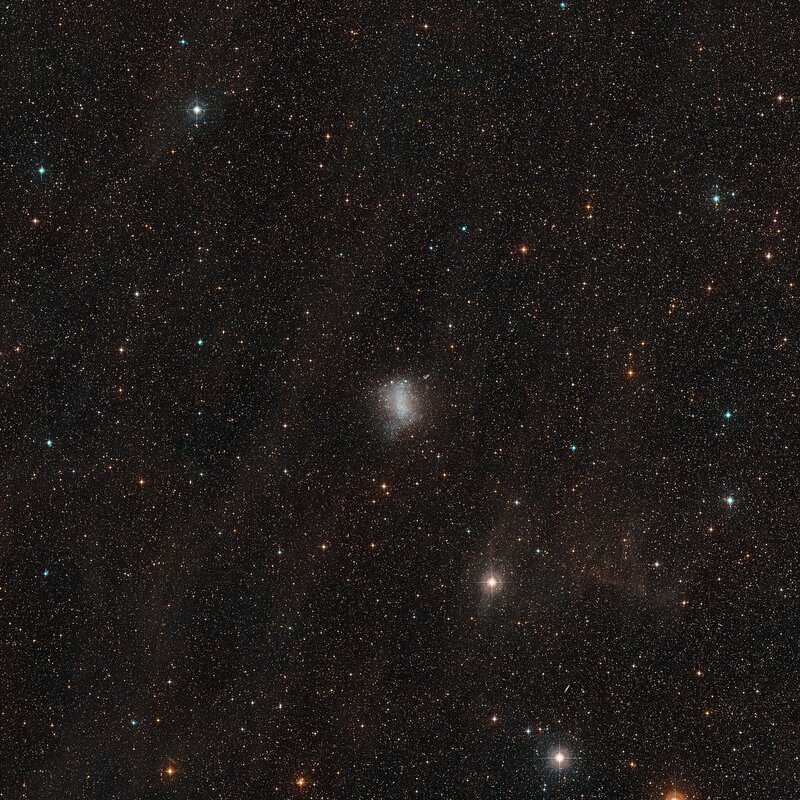 Even though Barnard’s Galaxy lacks the majestic spiral arms and glowing, central bulge that grace its big galactic neighbours, the Milky Way, the Andromeda and the Triangulum galaxies, this dwarf galaxy has no shortage of stellar splendour and pyrotechnics. Reddish nebulae in this image reveal regions of active star formation, where young, hot stars heat up nearby gas clouds. Also prominent in the upper left of this new image is a striking bubble-shaped nebula. At the nebula’s centre, a clutch of massive, scorching stars send waves of matter smashing into the surrounding interstellar material, generating a glowing structure that appears ring-like from our perspective. Other similar ripples of heated matter thrown out by feisty young stars are dotted across Barnard’s Galaxy. 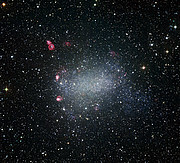 At only about a tenth of the Milky Way's size, Barnard’s Galaxy fits its dwarfish classification. All told, it contains about 10 million stars — a far cry from the Milky Way’s estimated 400 billion. In the Local Group, as elsewhere in the Universe, however, dwarf galaxies outnumber their larger, shapelier cousins. Irregular dwarf galaxies like Barnard’s Galaxy get their random, blob-like forms from close encounters with or "digestion" by other galaxies. Like everything else in the Universe, galaxies are in motion, and they often make close passes or even go through one another. The density of stars in galaxies is quite low, meaning that few stars physically collide during these cosmic dust-ups. Gravity's fatal attraction, however, can dramatically warp and scramble the shapes of the passing or crashing galaxies. Whole bunches of stars are pulled or flung from their galactic home, in turn forming irregularly shaped dwarf galaxies like NGC 6822. ESO, the European Southern Observatory, is the foremost intergovernmental astronomy organisation in Europe and the world's most productive astronomical observatory. It is supported by 14 countries: Austria, Belgium, the Czech Republic, Denmark, France, Finland, Germany, Italy, the Netherlands, Portugal, Spain, Sweden, Switzerland and the United Kingdom. ESO carries out an ambitious programme focused on the design, construction and operation of powerful ground-based observing facilities enabling astronomers to make important scientific discoveries. ESO also plays a leading role in promoting and organising cooperation in astronomical research. ESO operates three unique world-class observing sites in Chile: La Silla, Paranal and Chajnantor. At Paranal, ESO operates the Very Large Telescope, the world’s most advanced visible-light astronomical observatory. ESO is the European partner of a revolutionary astronomical telescope ALMA, the largest astronomical project in existence. ESO is currently planning a 42-metre European Extremely Large optical/near-infrared Telescope, the E-ELT, which will become "the world's biggest eye on the sky".